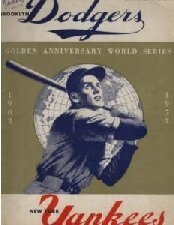 The 1953 World Series matched the four-time defending champion New York Yankees against the Brooklyn Dodgers in a rematch of the 1952 Series. The Yankees won in six games for their fifth straight title—a mark which has not been equalled—and their sixteenth overall. Billy Martin recorded his twelfth hit of the series scoring Hank Bauer in Game 6, and won the Series MVP. In a classic rematch of the previous year's classic, "The Bronx Bombers" and "The Bums from Brooklyn" returned for yet another "Subway Series". The Yankees were poised for their fifth consecutive championship title and the Dodgers were ready for revenge. 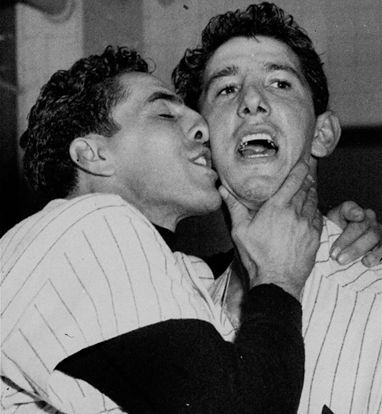 Brooklyn had given their cross-town rivals a run for their money, but had come up short in Game 7 thanks to a miraculous catch by Billy Martin that stopped a late inning comeback. Many felt that this was their year as the pitching staff had come up big during the regular season. Carl Erskine led the rotation with twenty victories, Russ Meyer went 15-5 and Billy Loes boasted a 14-8 record. Preacher Roe posted an 11-3 total, boosting his three-year mark to 44-8 and Clem Labine won ten games in relief and eleven outings overall. The veterans weren't the only ones contributing as rookie pitchers Johnny Podres and Bob Milliken both combined for a 17-8 mark. This solid line-up on the mound enabled Charlie Dressen's team to win the National League pennant race by a staggering thirteen games over the newly moved Milwaukee Braves. The '53 American League representative was the typical Yankees team that featured strong performances on both sides of the plate throughout the regular season. Yogi Berra (who hit .296) and Mickey Mantle (who batted .295) both combined for two-hundred runs batted in and Gene Woodling (.306) and Hank Bauer (.304) led the line-up in hitting. The Yankees top five pitchers were even better with a 74-30 record. Whitey Ford, who had returned from a military tour of duty, led the staff with eighteen victories and veteran Eddie Lopat, who topped the league with a 2.43 ERA. Game 1 of the '53 Series began as Game 7 in '52 had ended with Billy Martin knocking the wind out of the Dodger's sails. The second baseman nailed a three-run triple in the first and went on to collect three more hits in the 9-5 opening victory. Berra and Joe Collins both hit homers for the Yankees, and Jim Gilliam, Gil Hodges and George Shuba contributed for the Dodgers. On a side note, Shuba's shot was the first "pinch homer" by a National League player in World Series history, but the record did little to numb Brooklyn's pain. Martin continued to plague the Dodger's pitching rotation in Game 2 by adding a game-tying, bases-empty homer in the seventh. Mantle also continued adding to his ever-growing, post-season stats with a two-run drive that nailed down Lopat's 4-2 win over Preacher Roe. Things changed dramatically in Game 3, as it was the Dodgers besting the Yanks on the phenomenal arm of Carl Erskine. Brooklyn's leading ace set a World Series record of his own with fourteen strikeouts (four of them versus Mantle) and MVP Roy Campanella finished the job with a tie-breaking homer in the eighth that lifted Brooklyn to a 3-2 victory. Hitting was the decisive factor for the Dodgers in Game 4 as the ever-present Duke Snider contributed two doubles and a homerun along with Gilliam who had three doubles of his own for the 7-3 victory. Unfortunately, that was all they could muster and the Yankees would have little resistance for the rest of the contest. Game 5 once again belonged to Billy Martin and Mickey Mantle who both knocked one out of the ballpark on the way to an 11-7, twenty-five hit blowout (Mantle's was a grandslam). Game 6 was a closer effort, but unbelievably, it would be Martin again who would seal his second Series victory in a row with the game-winning run in a 4-3 triumph. The combative second baseman had tallied twelve hits (a record), eight RBIs and a staggering .500 average against the Dodgers who had lost the Series for the seventh time in seven outings. The Yankees on the other hand, had won a record fifth consecutive title, were fifteen for sixteen in World Series appearances and had kept the trophy in the American League clubhouse for the seventh year in a row.